I guess that Google feels bad about the way that it has helped to injure, maim and in some cases, kill newspapers. Why else would it spend its time and energy to roll out a new product that it hopes will revive them? I’m talking about Living Stories, a Google experiment to help newspapers present all of their content on a specific topic on a single web page. Right now, you have to hope that the keywords entered into the papers’ search engine turn up all of the articles in your selected topic, but frequently some are missed. 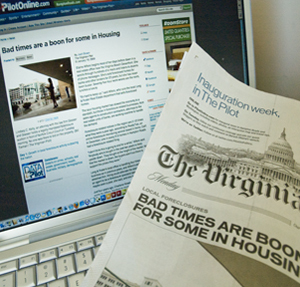 Living Stories is a partnership between Google, the New York Times and the Washington Post. As is often the case in technology experiments, the devil is in the details. If a subject page becomes a defacto authority on a certain topic, I can see it getting a lot of page views. But newspapers tend to be slow and deliberate when it comes to publishing articles on weighty topics, so the time between a post and a new article in a single newspaper may be too long for today’s Google-addicted immediate satisfaction-seekers. As with all efforts to resuscitate newspapers, I’m all for it. I just think this one may not have the horsepower to drag the publishers out of the abyss.